You are here: Home / Apparent Age / The Toba Super Eruption: A Non-Flood Catastrophe – The Artifacts Say Yes! I was intrigued by several articles that were just published this month in the journal Quaternary International . The entire May issue is devoted to research devoted to understanding history and implications of the Toba volcano super-eruption. The Toba volcano is found near the center of Sumatra, Indonesia. It is not much of a volcano anymore because in the past it completely blew its top and then collapsed into what is called a caldera which then filled with water to form a huge (100km x 30km) lake. It has been estimated that at least 2800 cubic kilometers of material was thrown into the air during the explosion or series of explosions. To put that in perspective the Krakatoa volcano threw just over 2o cubic kilometers of material into the air some of which circled the globe causing dazzling sunsets in Europe. Mt. St. Helens in Washing State only threw 1 cubic kilometer or less into the air so this Toba volcano was some 2800 times as large! In fact, the Toba super-eruption may be the single largest volcanic explosion in earth’s history. Lake Toba which is found today in the collapsed caldera crater of Toba volcano in Sumatra. The mountains in the distance form the rim of this huge crater. This lake is 100km long and 30km wide and was formed after an estimated 2800 cubit kilometers of ash was thrown into the atmosphere. For comparison, Mt. St Helens in Washington State only spewed 1 cubit kilometer of ash. 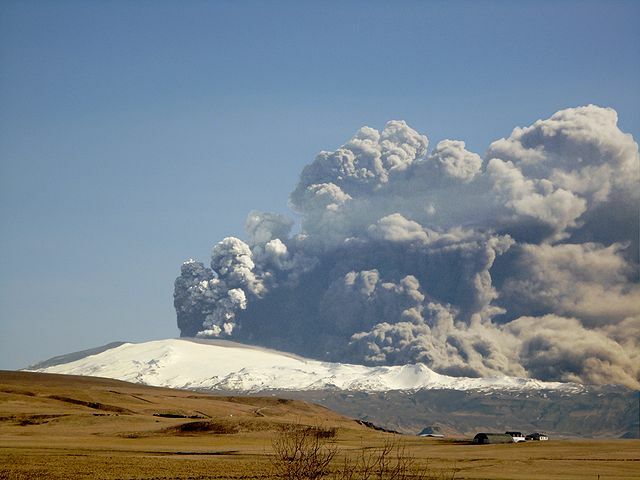 The extent of this eruption is difficult to comprehend and can hardly be overstated! It was MASSIVE but how do we know? The size of this explosion is estimated from both the vast hole it left where the volcanic peak must have once stood (see the picture above of the lake that now resides in what is left of the volcano) but also from measurements of the ash layer, called tuff, it left over all of southeast Asia and even most of the Indian subcontinent. This ash layer can be over 1000 feet thick near the volcano to several inches as much as 2000 miles away. Signs of this volcanic eruption are even recorded in the Greenland Ice cores. A thick layer of ash several inches to a foot thick is found in cores pulled from the floor of the Indian and South China Sea. This ash layer can be assigned with little doubt to this particular volcano based on the ratio of a number of chemicals that make up the magma of the Toba volcano. Studies (see references below) of the most recent Toba super-eruption tuffs called the YTT (youngest Toba tuff) suggest, not surprisingly, that this event effected the climate of the earth by blocking the sun resulting in lower temperatures and less rainfall, causing wide scale changes in vegetation beyond even where the ash fell. Where the ash did fall, dramatic changes in vegetation structure can be inferred. Vegetation analysis of pollen and plant parts found in sediments below the ash layers in India and Indonesia have been performed and in sediment cores from the Indian ocean where fine scales pollen analysis can be performed to see what pollen was drifting in the air over the ocean from the continent and settling to the ocean floor. What these data strongly suggest is that there were widespread tropical forests and dense deciduous forests with little grass in most of India prior to this volcanic eruption. Above the ash layers much dryer conditions prevailed with grasslands contributing to the fossils in the sediments immediately above the ash layers. When did the Toba Super-Eruption Happen? You might be wondering, wow, very interesting, but why haven’t I heard of such a HUGE event in Earth’s history? Well, I haven’t said when this occurred. Dating of the Toba tuff layer and sediments above and below the tuffs from many locations have all yielded a date of around 74,000 years ago. This corresponds with small global climate changes recorded at the same dated age on the Greenland and Antarctic ice cores. With respect to young earth creationism this date is a problem but irrespective of radioactive dating, I think it is clear that this layer of volcanic tuff is not particularly young because it is found many tens to hundreds of feet under other sediments in many places in Asia and under 10 to 50 feet of sediments in sea floor cores. Ok, you might be thinking this is just another example of a dating problem and some apparently old features of the sedimentary record and so not really that profound. Most YECs acknowledge the existence of super volcanoes in the past but they always propose they happened during or right at the end of a global flood (see refs for some examples). So is this just a case of another volcano that caused devastation during a time that was catastrophic anyway? Not at all! There is another aspect of some very recent research on the Toba ash that suddenly has made this particular volcanic event of much greater significance to the creation debate. The YTT (youngest Toba tuff) ash layer is particular relevant to any discussion of human origins and migration and is why this ash layer has been studied so intensively the last 5 years. 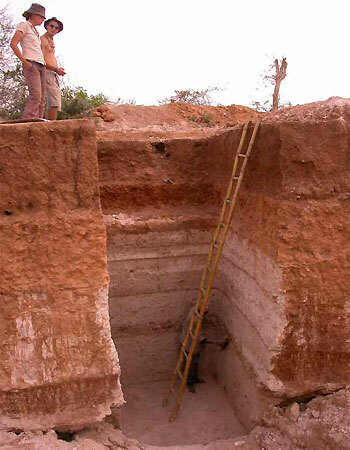 Why, because in a valley in southern India (see picture to right) where this ash layer has been preserved very well, more than 200 stone artifacts have been found in layers of sediments just BELOW the ash layer. 500 miles to the north there is another site where this ash has been investigated and evidence of human occupation below the ash has been found there as well. The inescapable implication of these stone tools is that people were living in India when the volcano blew its top. For the past three years anthropologist have hotly debated who these people were that left these stone tools at this location and whether they were all killed by the volcano and had to repopulate southeast Asia from Africa/Middle East again or if they survived in small numbers and repopulated the region but that debate is not my primary interest here. 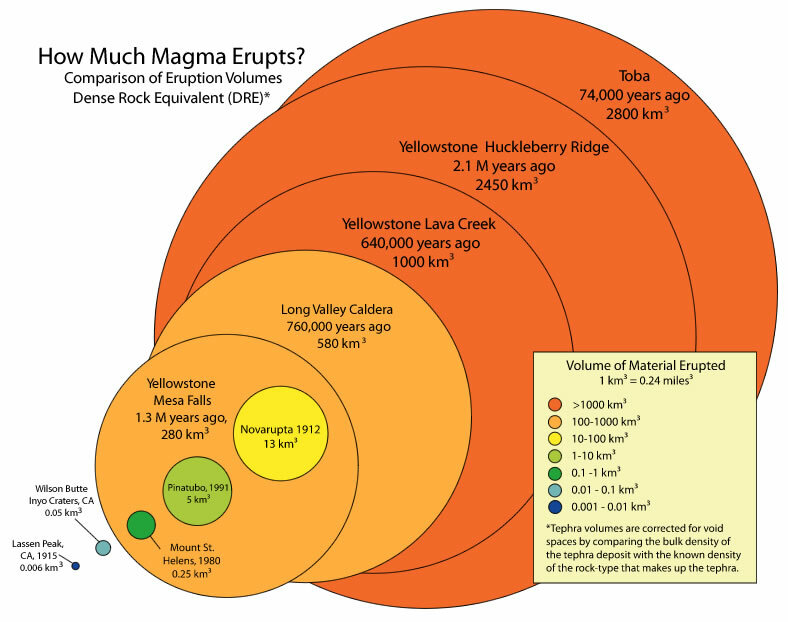 This massive and apparently world-altering volcanic explosion cannot be explained away as having happened during the global flood as are many other super volcanic events, such as those of the Yellowstone caldera, by YECs. Here we have an example of a volcano that must have obliterated nearly all life on Sumatra when it blew and likely completely deforested most of Indonesia, the Philippines, Thailand and even parts of India. Massive layers of air-borne ash would have killed the majority of animals in this entire region. But rather than try to explain this as happening while Noah and his family where safe inside the Ark the evidence of humans occupying a site before this massive volcanic eruption means that this volcano has to have blown its top in the very recent past according to the YEC time line. This is because most Creationists argue that all humanity was gathered together at Babel and it is expected that Babel didn’t occur until several hundred years after the Flood. Logically, then these stone tools could not have been dropped at this location in India until well after that point. Hence, for young earth creationists, the volcano didn’t destroy Sumatra until well after the dispersal of peoples from Babel. So far I have been unable to find a single comment by young earth creationists about the significance of these artifacts apart from a reference (see below) by Brian Thomas at ICR who uses the presence of artifacts as evidence that these people were fully human and not some other species but seemed to be quite unaware of the implications of the position of these artifacts for the creationists’ time-line. There is so much more that could be said about this site and its implications but I don’t want to distract from the main point: Within a young earth worldview, this is almost as close as you can get to proof that people had already migrated long distances and had to deal with a major catastrophe that could not have been part of a global flood event. So, when did these people live? How did they get there? How could much of this ash be covered by many dozens to hundreds of feet of sediments including many other “ancient” sites of human occupation that predate any written record? Why did the people who lived here only have very crude rock flaking technology if they had just dispersed (probably in less than one lifetime) from building a sophisticated tower of Babel? How could this massive eruption not have been noticed by people all over the world and been recorded in human history? When it comes to the human origins, there are no simple answers to these questions for anyone who wishes to compress these events into a short time window. This is a link to the Article index for the May issue of Quaternary International. If you have access to the articles there is a wealth of information here. A science direct highlight of research on the human occupation of this region at this time. http://www.icr.org/article/supervolcanoes-mount-st-helens-eruption/ – Supervolcanoes and the Mount St. Helens Eruption, By Steven Austin. Here Austin presents an argument for supervolcanoes during the flood with gradual reduction of force after the flood to the present. http://www.icr.org/article/early-advanced-human/ – Brian Thomas of ICR makes comment on the Toba eruption but doesn’t say when and doesn’t mention the volcano’s power. He just uses it as an example of humans in India being advanced (advanced apparently means only capable of making stone tools?!). Hi Ashley, thanks for the comment. I agree there are many other catastrophic events for which we see records and for which there are records of their effects. My post was aimed at those that view all large catastrophes and fossil producing processes as the result of a global flood. The remains of human occupation prior to a really large catastrophic event that undoubtedly also fossilized many organisms just like the Yellowstone eruptions contradicts the usual YEC message that fossils could only have been produced by a global flood. I’m glad you Vesuvius is a good example of actualism in action. We have written documentation of historical eruptions of Vesuvius but what is interesting is there is a record of many many additional eruptions in the geological record around the volcano. Only the top most layers of volcanic ash and pryroclastic flows represent the historical record of the past 4000 years but the layers below tell of many many more discrete yet very similar events. Where is the global flood when the historic record goes right back to 4300 years and the rocks continue beyond that without a dramatic break. Whilst you make a very good case this couldn’t have happened during the flood, what about if it happened before it? 1)	Young earth creationists – My post tries to nail this site down for them as post-flood from them. What I didn’t say is that there are 20,000 feet of fossil bearing layers of rock below this site where human occupation is evidenced below the ash layer. I can’t imagine any young earth creationists suggesting that this site existed prior to the flood. They would have to believe that the flood make almost no impact on the surface of the earth and they would not have a means of explaining all the other fossils if the flood did not lay down all that rock below this site. 2)	Young history (6000 years) but old by appearance of age – this very rare (but common in the past) position posits all the rocks as being created as they are with apparent age and even fossils might have been created with apparent age. In this case I suppose this ash layer could have been simply created with apparent age (even the volcano didn’t really erupt just apparently did). However, the remains of human occupation is something that even a staunch apparent age advocate would have trouble getting past. I have not seen any that wan to say that human fossils are the result of creation with appearance of age. 3)	Old earth creationism (Hugh Ross variety) – In this case I there was no global flood and no need for a young earth. So acceptance of the 74,000 year time period is not really a problem but I think that Ross likes to put the origin of modern humans around 24 thousand years various reasons having to do with technology/religion evidenced in the fossil record. But he is willing to go as deep as maybe 60,000 years for modern man. I believe that for Ross these occupation site would represent evidence of other hominid species that were around before modern man. In this case the Toba volcano may have been a providential happening that helped to remove these other hominids laying foundation for his bringing modern spirit-bearing man into existence. 4)	Theistic evolutionists I would think probably don’t have a problem with the dating or the presence of hominids at this location but it does bring up evidence that has to be addressed in the discussion about a singular and historical Adam and Eve and when they lived. Given the flood is also given as an explanation for fossils by YECs, the quantity of such layers below the find is a clear indication it would be either during or after the flood. Thank you for clearing that up. You might want to add that fact to the post though, that singular statement is a pretty effective counter to thinking it is pre-flood. I would agree with your first statement. However, Bonobos have some capacity to make stone tools but their stone tool technology is no where near that observed in the tools buried beneath the Toba ash. The latter tools show a great deal of sophistication and require a high degree of learned behavior and planning. Unless we discover far greater capacities in chimps that is currently observed it would be difficult to assign these tools to a chimpanzee. Your comment about hugh ross putting the creation of modern humans after the toba supereruption is not really correct anymore. Recent articles and podcasts on RTB suggest that they have shifted to saying the creatures living at Blombos cave (dated to ~75k BP) are human and post-noah. Fuz has even suggested that the early “homo-sapien” skulls in ethiopia 200k – 150k BP are descendants of adam and eve. Personally, I feel that Adam and Eve were most likely created after toba. I view toba as the final major stepping stone before creating humans. Removing archaic sapiens from the picture. But RTB apparently disagrees nowadays. I understand why they do that, but I disagree with their logic. Just thought I would fill you in. Further to my previous comment, in fact the famous Pompeii eruption of Vesuvius was in 79 AD. But there was a previous eruption around 2420 BC according to Wikipedia (that’s the one around a century before ‘Noah’s Flood’ that I was referring to). Noah’s flood occurred in the late Holocene to early Neolithic. 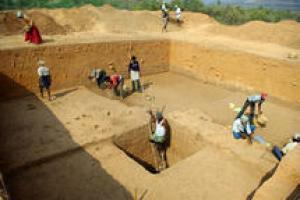 The stone tools found in Southern India date to before 74,000 years, but they are not the oldest stone tools. Those were found in central Africa on the shores of a Paleolake and are dated about 100,000 years. Almost identical hand axes have been found by Thomas Strasser and his team on the island of Crete. They found hundreds of these stone hand axes of African origin dating at least 60,000 years. Other ancient stone tools have been found on the Iranian plateaus. According to Hamed Nasab Vahdati, a member of the archeological society at Iran’s Cultural Heritage Center, the Stone Age artifacts found in Iran are very similar to those found in East Africa. At least three migrations out of Africa have taken place in the past 120,000 years. The first that has been documented took place in the Late Pleistocene (120,000-12,000 B.C.). A second migration happened around 75,000 years ago. This was likely the migration of the Nilotic Ainu, a seafaring people who went al the way to Japan and Finland, and from Finland to NE Canada. The Kushite migration took place between 8,000 and 1000 B.C. This was movement was from the Upper Nile Valley/ Horn of Africa into northern Arabia and Mesopotamia. This marked the beginning of the Akkadian culture under Sargon the Great (probably Nimrod of Gen. 10:8-12). Thanks for the fascinating article! I think that this is just another one of many devastating arguments against YEC from a scientific viewpoint. Hi I am definitely not a proponent of YEC, but I am trying to understand their exact position and all of its implications. Therefore I came up with the following question. Could YECs explain the tools found under the volcanic ash layer by assuming that human beings had travelled there just before the Flood? Then the wipeout caused by the Flood could have relocalized humanity to the region of Babel a hundred years later. Is such an explanation consistent with the YEC framework or does it lead to other contradictions in their ‘model’? Thank you for your thoughts. I greatly appreciate the content of your blog. I’ve wondered if Young Earth Creationists will ever admit to themselves that the reason geology does not at all support a global Noahic flood is because the Bible doesn’t either. Genesis speaks of a flooding of the ERETZ, the “land”, “country”, or “region”. After all, the Old Testament as well as the modern nation of the same name speaks of ERETZ YISRAEL: “the Land of Israel” or “the Nation of Israel”, not PLANET Israel. There is no good reason to assume that ERETZ referring to “planet earth”, a concept that the ancient Hebrews simply did not have. A GLOBAL flood is a tradition, not a statement of scripture. “Earth” in 1611 English had a meaning very similar to ancient Hebrew for ERETZ: it meant the opposite of sky (the heavens) and the earth was what one tilled. It was basically “the ground” on which people walk. Construing ERETZ as “planet earth” is anachronistic—which is why the Biblical scholars (myself included) have long recognized it as “land” or “country”. Even in the KJV Bible, ERETZ is usually translated as “land” or “nation”. And it is sometimes applied to small regions, such as the ERETZ where the Children of Israel wandered in the wilderness for 40 years.